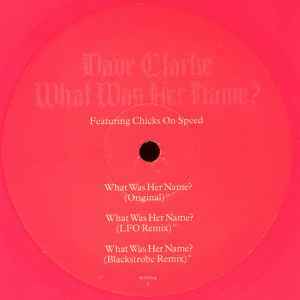 Dave Clarke Featuring Chicks On Speed ‎– What Was Her Name? Published By – Universal/Momentum Music 3 Ltd.
Comes in a clear plastic sleeve that is sealed with a sticker. Chicks On Speed appear courtesy of Chicks On Speed Records/Labels Germany. Published by Edition Söder & Wacha / Warner Chapell / Universal Momentum Music 3 Ltd. Contains a sample of 'She's In Parties' by Murphy/Ash/Haskins/Jay (Bauhaus). Taken from the album 'Devil's Advocate'. Durations do not appear on release. Reminds me of Chrisma - Black Silk Stocking. well... i think this is the best release in the last months... and this will be a song that we will hear in many partyes. for years. the original version is a blockbuster, with kickass bass and a little electroclash influenced vocals (miss kittin is using such vocals). the mix of LFO uses not so much vocal, but the bases are turned to idm... this is a masterpiece too. the bass is beautyful... its beautyful. the mix from blackstrobe concentrates on madmaking of bass: finally has a goa like one. the EP is absolute masterpiece, highly recommended. 5/5.